Frosted eggnog cookies are made with egg yolks, rum extract and nutmeg to taste just like the holiday drink! 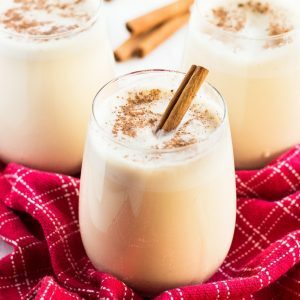 I feel like I have been on the gingerbread train since November 1st, but recently I have been craving some good old fashioned eggnog. I took the holiday cocktail and made it into a cookie this year! These cookies taste so much like the drink (see my homemade eggnog recipe here). 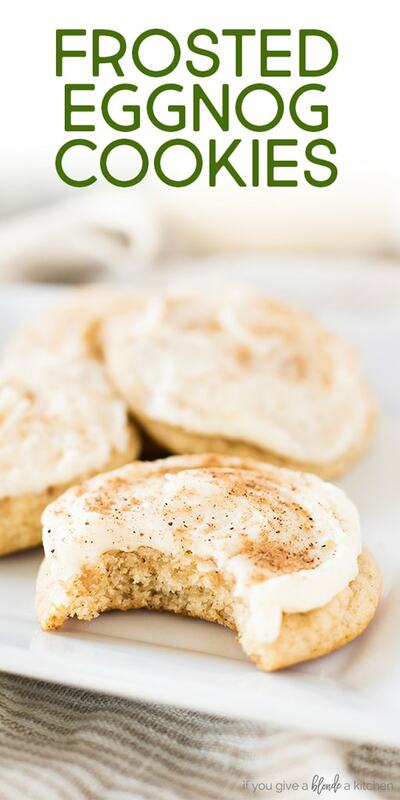 They are chewy yet soft and topped with a buttery smooth eggnog frosting. Making these cookies was surprisingly easy. The base is your standard cookie dough (flour, baking soda, salt, butter, sugar and eggs). I like to use half granulated sugar and half brown sugar for my cookies these days because it makes a chewier, and in my opinion, more flavorful cookie. 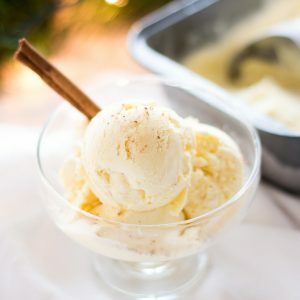 The eggnog flavor comes from nutmeg, egg yolks, rum extract and eggnog. I used all three in the batter to make sure each bite was packed with holiday taste. If you can’t find rum extract, you can use the real thing! I have substituted 1 teaspoon white rum for the 1/2 teaspoon rum extract. It still adds a little punch to the cookies. So the frosting is where it’s really at (I feel the same way about my eggnog cupcakes). The frosting is buttery smooth and also made with eggnog. The sprinkle of nutmeg is essential to make the cookies look just like the cocktail. Sometimes I like to add a little rum to the frosting too. Same as the cookie dough, swap out the 1/2 teaspoon rum extract for 1 teaspoon white rum. These cookies will get you into the holiday spirit in no time! The eggnog cookie dough can also be made ahead and frozen for up to a month. Life gets hectic around the holidays so it’s always a safe bet to have some cookie dough in the freezer for last minute gatherings (or sweet tooth cravings). The frosting does have to be made the day you bake the cookies, however. Freezing frosting makes it lose its consistency so it’s always better to make it fresh! It will also give you and excuse to pull out the ‘nog and rum and make yourself a drink! Get your baking supplies out, turn on Christmas Vacation and bake some eggnog cookies. You’ll be singing Christmas carols in no time! 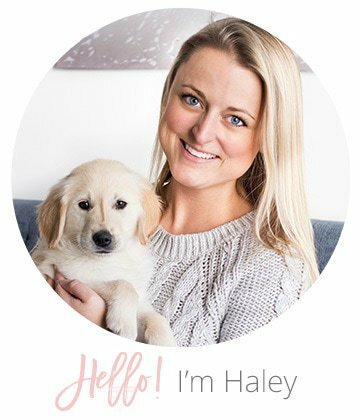 If you’re looking for more Christmas cookie recipes, check out my 25 Days of Christmas Cookies eBook! 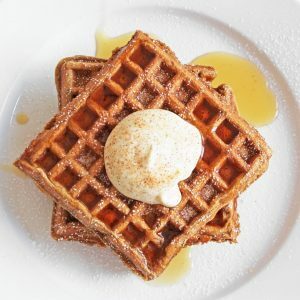 In a medium bowl, whisk together flour, baking powder, salt, nutmeg and cinnamon. Set aside. In the bowl of an electric stand mixer (or using a hand mixer), mix butter, granulated sugar and brown sugar until light and fluffy, about 3 minutes. Add egg yolks one at a time, mixing just until combined. Add vanilla extract, rum extract and egg nog and mix until incorporated. With mixer set on low speed, slowly add in dry ingredients and mix just until combined (avoid over mixing). Scoop dough out by heaping tablespoonfuls, gently roll into a ball and place on prepared baking sheet. Space cookies 2-inches apart. Bake in preheated oven for 11 to 13 minutes. Cool on baking sheet for 5 minutes before transferring to a wire rack to cool completely. Prepare the egg nog frosting. In the bowl of an electric stand mixer (or using a hand mixer), whip butter until very pale, about 3 minutes. Add the rum extract and 3 tablespoons eggnog and mix just until combined. With the mixer on low, slowly add powdered sugar. If necessary, add more eggnog one tablespoon at a time to reach desired consistency. Use an offset spatula to spread frosting on cooled cookies. Sprinkle lightly with nutmeg if desired. You may substitute rum extract for the real thing. Substitute with 1 teaspoon white rum. Store cookies in an airtight container in the refrigerator for up to five days. You may let cookies come to room temperature before serving if they were kept in the refrigerator. Dough may be stored in the refrigerator for up to 2 days or in the freezer for up to a month. Let dough defrost in the refrigerator before bringing to room temperature and baking. 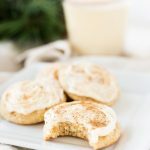 If you like this frosted eggnog cookie recipe, try these recipes!